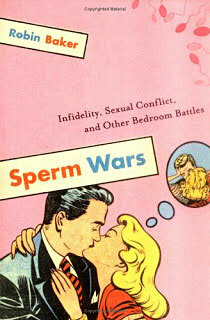 Before picking up Sperm Wars, I had eyed it as a source of answers for some of the most difficult questions I had about myself and the romantic relationships I’ve been involved in. To its credit it has, in most regards, met and even surpassed this objective. It provides an unbiased scientific look at the biological programming evolution has laid upon us; how it functions, how it malfunctions, and the biological safeguards it sets inside our physical bodies and subconscious mind. The book is divided into broad sections covering a number of general topics, and within these are individual chapters split into two parts. The first section tells a fictional story about a sexual situation, how the parties react to the situation and to eachother, and what the outcome is. The second section explains each step of the process and why the characters made the unconscious decisions they did which resulted in the conclusion. As the book demonstrates, when reproductive success is the game, there are invariably winners and losers. Our ancestors were the winners, and their lesser contemporaries were the losers. That said, the attempted demystification of mating and the creation of families is a controversial topic, and I don’t think that this is information that everyone wants or needs to know. A girl I’m dating read selected portions of the book for 30 minutes and became depressed after being exposed to such a cold and logical explanation of a force which in her mind has always been an intangible and not-quantifiable force of God. Overall, this book provided the information I was looking for. The science behind attraction, dating ritual, and behavior. It wasn’t a difficult read either, with relatable scenarios to explain the concepts behind our evolutionary programming. No portions of the book felt glossed over or rushed through, which might not be a surprise when you learn that this book is just over 400 pages in length. Upon finishing Sperm Wars, you probably know more about the science behind attraction and evolutionary biology than anyone else in the room. Some other reviews on Amazon questioned the manufacturing quality of the book, and I can’t disagree with them. Certain pages weren’t printed with full contrast and were difficult to read, others printed slightly off center in relation to the page. The book isn’t binded very well, but mine didn’t fall apart. Obviously not an issue if you’re reading the Kindle version of this book. The content of the text is the main focus of my interest and of this review.